The Cotsen Open was held at the Korean Cultural Center, 5505 Wilshire Blvd., Los Angeles, CA 90036, on this past October 13 and 14. The sponsor, Eric Cotsen, has once again proven himself to be the most important promoter of go in the United States. The Japanese Go Association (Nihon Ki-in) has donated millions of dollars over the years to promote the game in this country (as well as worldwide), but they are rarely involved at the grass roots level. Eric takes part personally every step of the way, from the preliminary plans, to the organization and management of the tournament, competing in the tournament at the board, and acting as a gracious host at the award ceremony, where he hands out trophies and checks totaling thousands of dollars. One thing that Eric insists on is that attendees are given an ideal environment in which to compete. A nominal entry fee of $20 is required of all players in the tournament, but this is just to ensure that no one drops out before the final round. After they have completed playing all their games, the entry fee is returned to them. 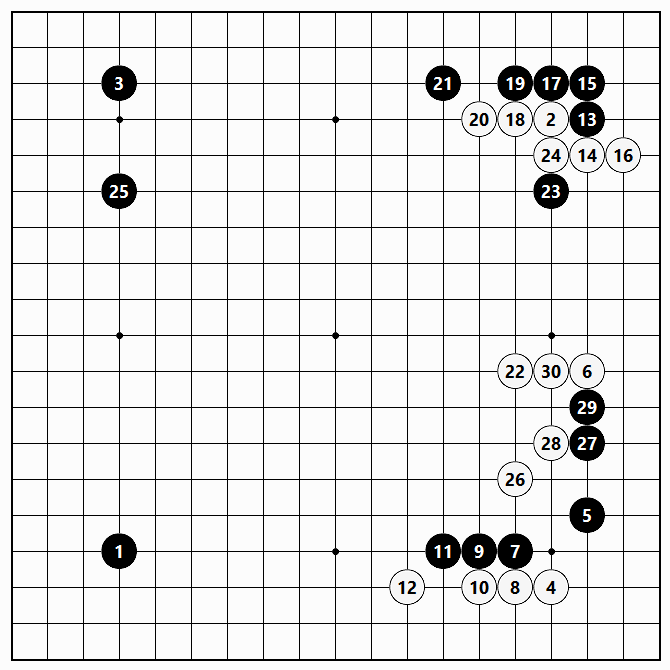 This is unique in the history of go and will be sure to be remembered many years from now. A lunch truck also caters the event. Participants in the tournament are treated to a free lunch on both days of the tournament. Masseuses offer massages to players during games to combat the stress that can accompany the playing of games. But what is best is the fact that professional go players come to rub shoulders with the players. Few American amateur go players ever get the opportunity to interact with such masters personally. Not only does Yang Yilun 7 dan oversee play during the tournament and make comments to players, from the weakest to the strongest, he also contests an online game with another top Chinese professional player, which attendees can watch. And Yang Sensei afterward replays the game on a demonstration board, explaining the nuances of the play. As someone who has witnessed Yang Sensei’s gifted instruction on dozens of occasions over the year, I can testify to the unsurpassed value of hearing Sensei give a lesson. Other professional players also attend. 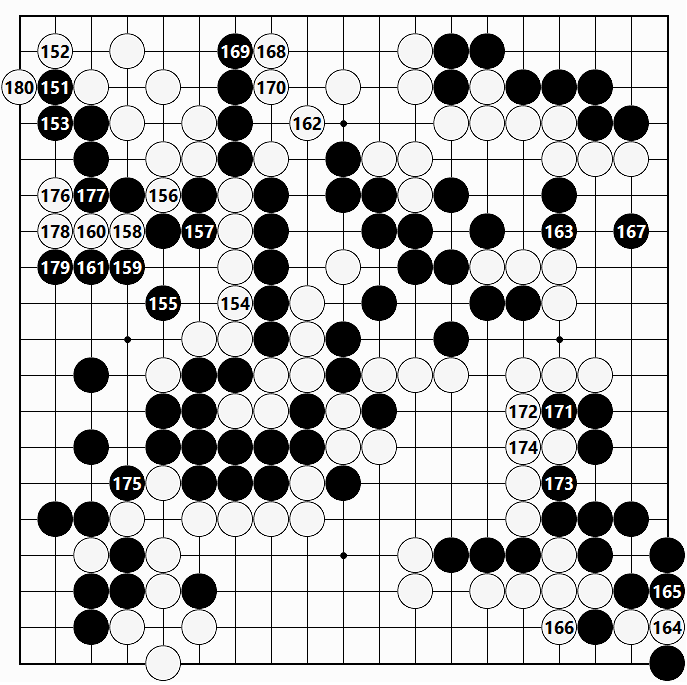 Two players from my Japanese go club (the South Bay Nihon Ki-in, 1641 W. Redondo Beach Blvd., Gardena, CA, 90247; Tel. (310) 327- 5757), Tony Emsenhuber and Kevin Carr, participated in the tournament. A dozen other Japanese players in the club, including quite strong ones, failed to appear. I do not even think they knew about the event. 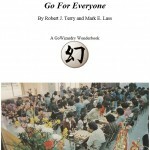 In the past, the Cotsen Open had a close connection with the Japanese go community. Now it seems to be more closely associated with the Koreans. There is no problem with that, but I feel bad that a faction connected with the Cotsen Open is turning its back on the Japanese go players in Los Angeles. It would be great if an effort would be made to reach out to those Japanese go players. 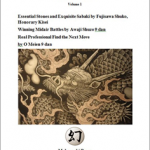 This minor quibble does not detract from the magnificent job that Eric Cotsen has done once again. Applause for him and his team! Nobody has ever done anything like it, much less better. Played on October 14, 2018 at the Korean Cultural Center, 5505 Wilshire Blvd., Los Angeles, CA 90036. 248 moves. White wins by 10 1/2 points. It seems that this game was recorded from the White side of the board. Black 1 was probably actually played in the upper right corner. Regardless of that, the game starts out as imitation go (mane-go), although White quickly deviates with the pincer at 6. This move aims at a leisurely paced game. White 10 is an odd move. White usually jumps to the point to the left of 10, since pushing one extra time on the third line is considered to be unfavorable. Perhaps White wanted to avoid giving Black forcing moves in the corner. Black 13 is also strange. It would be usual for Black make the attack on the corner at the point below White 14. That would be followed by White 14, Black 23, White 20 and then a Black two space extension two points above White 22. This would give Black a viable position on the right side, while White would not have much in the form of territory to count on. With Black 13 through 21, Black gains little more than 10 points in the corner. White’s position has more developmental potential. When Black makes the corner enclosure with 25, White attacks with 26 and 28. Black 31, played on the second line, leads to a position inferior to the one Black usually ends up with in this joseki. That might have been in keeping with White’s plan. In any event, White cuts with 32 and 34, building a strong position in the center. 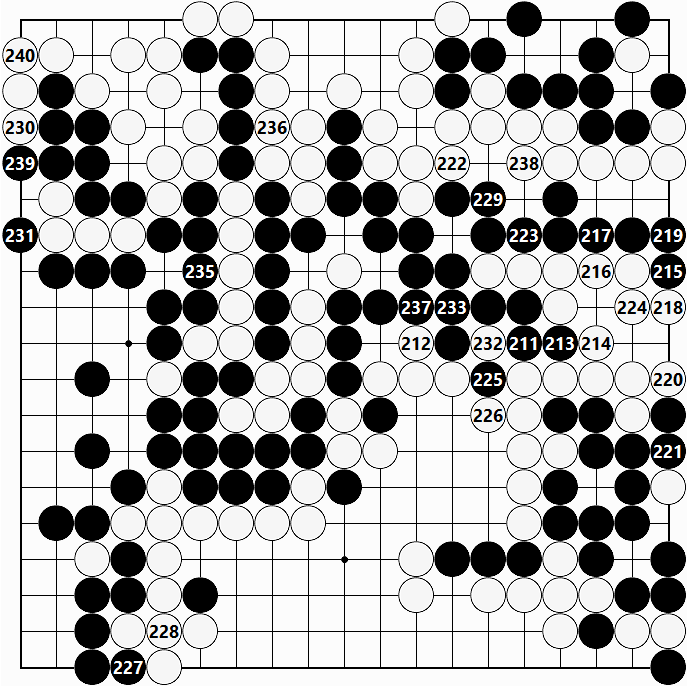 Black 39 takes territory in the lower left corner, while at the same time neutralizing White’s influence to the right. White 40 and 42 are forcing moves that leave White with the option of taking territory in the corner later on. However, at the moment, developing the territorial framework on the right side with 44 is a bigger priority. Black 45 is another neutralizing move. White counters with the forcing move at 46, then attacks Black with White 48. Instead of answering directly, Black makes another developing move at 49. If both sides consolidate the territory they have staked out up to now, Black will win. Black has territory in three different places, while White has territory in at most one place. How does the territory in the game stand now? It is hard to put a definitive number of the count, but it is reasonable to conclude that Black’s position on the left side will turn into 50 points. Black has 10 points in the upper right corner and 7 points in the lower right. Total: 67 points. White has a total of around 55 points. Plus the komi. Total: 61 1/2 points. The game is very close. For White to win this game by 10 points is surprising. Being able to push into White’s position with 61 and 63 is very satisfying for Black. 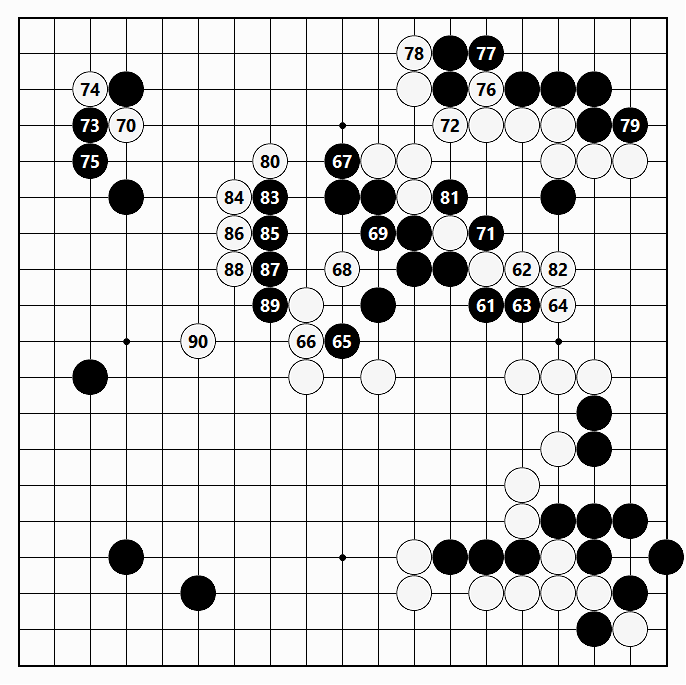 Then, turning at Black 67 makes thickness that neutralizing White’s potential for making territory on the upper side. Everything seems to be going well for Black. Capturing White’s stone with Black 71 and 81 is satisfying as well. Black is confident enough of having the advantage to take more profit with 79. There are two things that are in White’s favor, but are hard to use effectively. First, 70 and 74 give White the option of taking territory in the upper left corner. However, White will end in gote, so the timing is tricky. 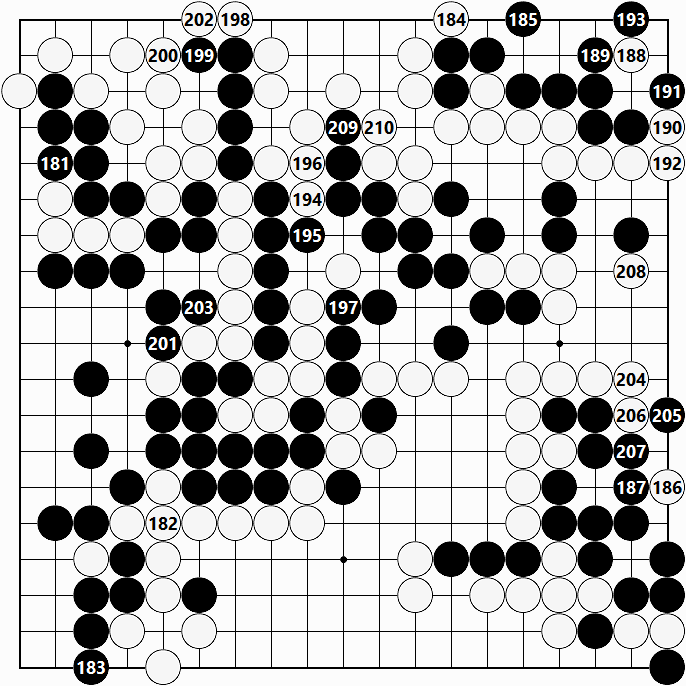 Then, Black’s group in the center can be attacked. That is exactly what White does with 80 through 90. But it is hard to carry out an attack successfully. 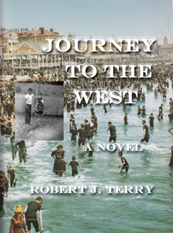 Groups escape or get settled in some way far more often than are captured. The fighting gets fast and furious in this figure. This is the most difficult position to annotate because anything can happen. So any variation that is suggested would take several complicated diagrams to explain it. Consequently, the only thing to be done is to point out the end result of the moves at the end of this figure. With 92 through 120, White consolidates the territory staked out in the beginning of this game. In fact, White has taken even a little more territory than was estimated back then. 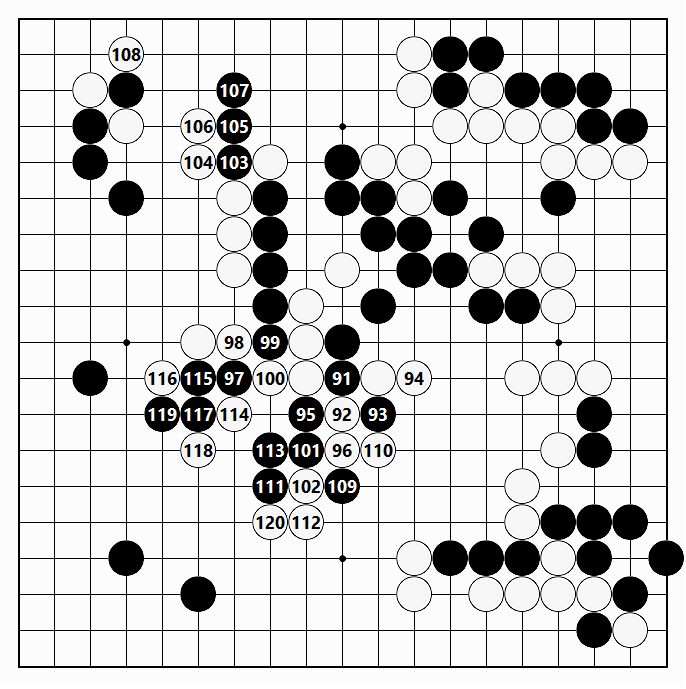 The earlier calculation envisioned White as taking territory from the stone above 93 straight down to the bottom of the board. White also gets in the move at 108. Therefore, White has accomplished the two aims mentioned earlier. Quite an accomplishment. However, White now has two other problems! First, White’s stones in the center connected with the stone at 100 are in a precarious position. Managing to come up with a survival strategy will not be simple. Second, White has a cutting point below the stone at 104 and the stones below that are in danger of capture. It is hard to see how White can escape unscathed there. 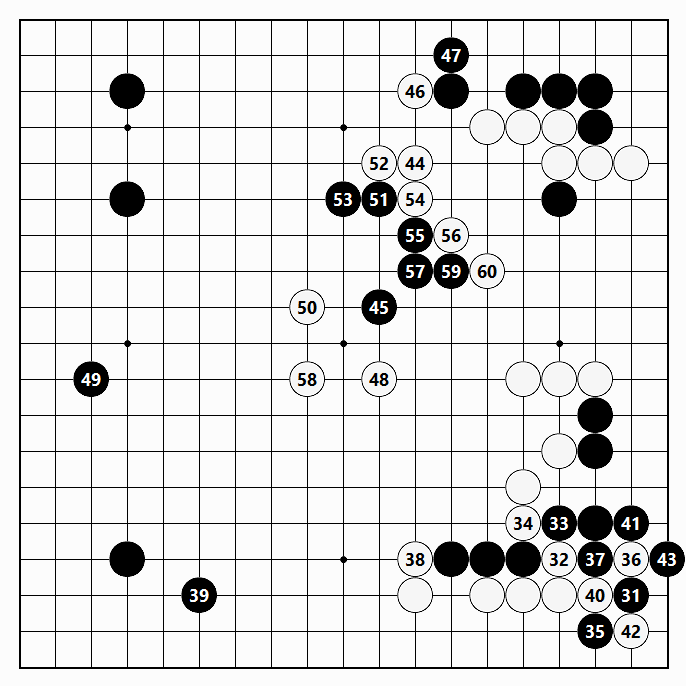 Black escapes with 121 but has to do so in bad shape. (Go proverb: Do not make empty triangles.) White surrounds Black’s stones with 122 and squeezes with the moves through 128, then even gets in the move at 130 in sente, damaging the lower left corner. Black 141threatens to cut at 143, but White is grateful for the chance to get in the move at 142. Then, when Black cuts at 143, White makes another capture at 142. After White 148, it is possible to count White’s territory more precisely. Recall that White’s territorial framework here was calculated before as being 55 points. It is now 65 points. 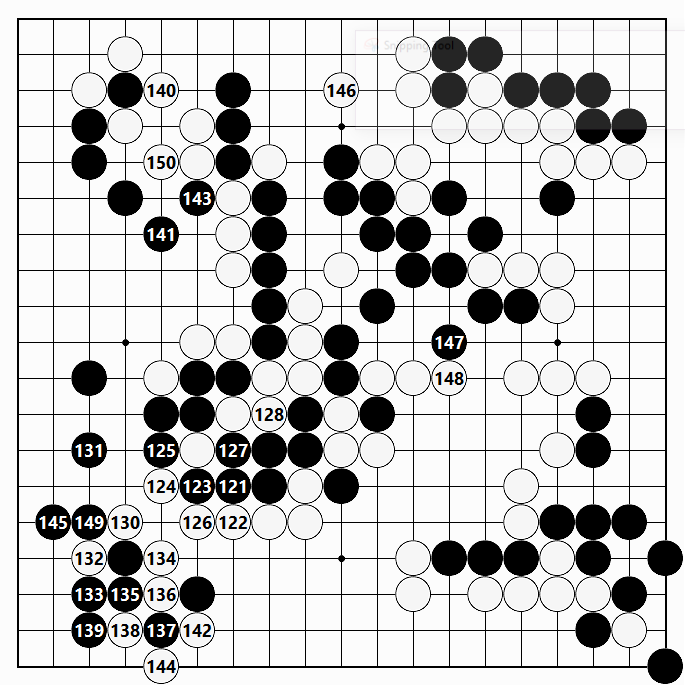 Although that might seem to indicate where White outstripped Black to win the game by 10 points, it must not be forgotten that Black has captured two White groups at the same time. Earlier Black’s potential territory on the left side was estimated as being 50 points. It is now 60 points. So both sides have increased the point count of their territories by the same amount, 10 points. That means that the game is still close at the time of the move at White 130. It appears that the losing move was made in this figure, but it is not clear which move that was! However, once the move at 146 is played, White has the advantage in the game. Is Black 163 the best endgame move? Wouldn’t it be better to capture White’s stone in the lower right corner? Consider this: after Black plays atari against the White stone there, White would play atari at 166, Black captures ad then Black could hane below White 166 and White could not block since Black could play atari to the left of that stone, bringing the captured three stones above back to life. Wouldn’t this have been the bigger endgame play? After the moves through White 180, Black will have to take White’s four stones below off the board. All of these skillful endgame moves by White show how talented the player is. The best sequence must have been worked out well in advance. The endgame continues in a routine manner. The only thing that might be pointed out is that White plays a good sequence in the upper right corner. The territory there was estimated before as 10 points for Black. It ends up as 9 points. In the process, White gets in the move at 186, which allows White to later play 204 and 206 in sente. There is nothing more to add. None of the moves in this figure are worth more than a point. This tournament win was the fourth in a row for Mark Lee. He is certainly a fine player. Eric Cotsen must feel great knowing that the tournament that bears his name has helped to cultivate the talent of players who are now approaching solid professional status.